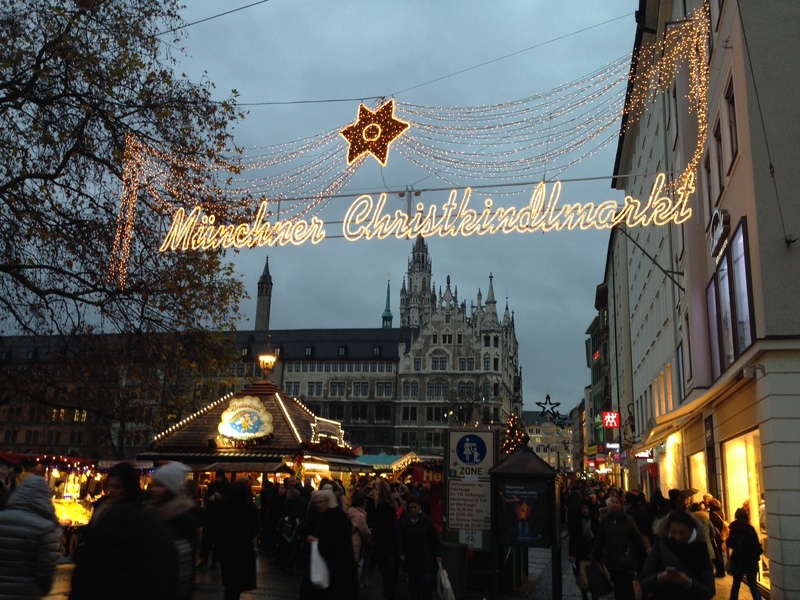 The Christkindlmarkt at Marienplatz in Munich begins Thanksgiving weekend and runs through Christmas. The market booths run throughout the shopping streets and are a bit spread out. It snowed the weekend we arrived which really kicked off the Christmas market season experience. The Neue Rathaus at Marienplatz is gorgeous with the famous moving Glockenspiel we were lucky enough to catch “dancing” when the clock struck noon. It lasts a pretty long time, over 10 minutes with the bells ringing along. 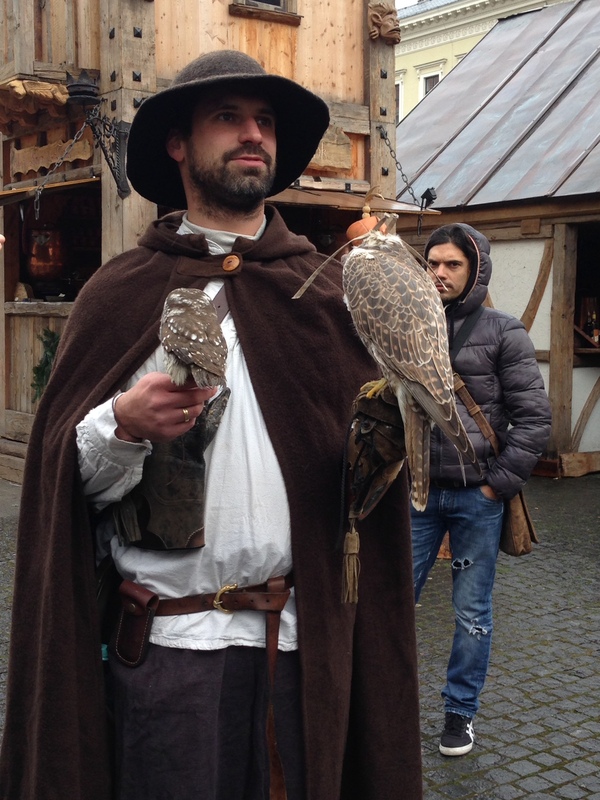 The medieval market section was one of our favorite markets located off of the square (sorry Esslingen, we liked Munich’s better). There were performers, men holding live owls, everyone was wearing costumes, and the hot beverages were served in clay chalices instead of the usual market mugs. Tollwood market, held in the fest grounds, was recommended to us by a bartender at one of the pubs. 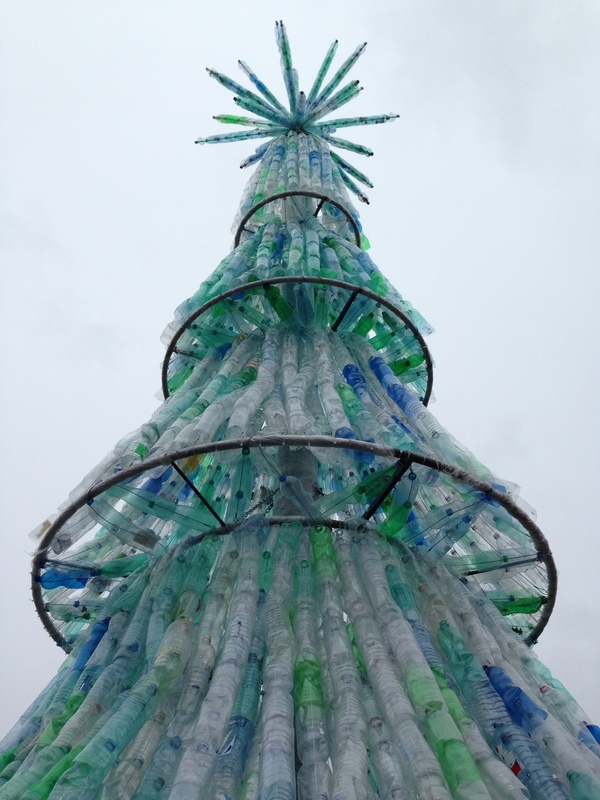 It was easy to get to by train and the theme was environmentally focused, with really strange art exhibits in addition to free live music and market stands with unique vendors and foods both indoors and outdoors. It was huge. My mom would have loved it. If it wasn’t for the rain that day, we would have explored it more. Our most favorite section of the main Christmas market we stumbled upon the last day was on an off-street and offered areas with fire pits to warm up, and a special Weihnachten beer just for the market. Really cute, plus being located off of the main market street, it was less crowded to hang out. In search for Bavarian doughnuts (when in Bavaria) the most frequent and unique street sweet we came across were fried apples that looked like doughnuts. They’re best things because despite the fried outside, it felt healthier eating a solid apple slice on the inside, even though it is definitely not. Feuerzangenbowle was much easier to find in Munich than in Stuttgart, of course Gluhwein (spiced hot mulled wine) was at every corner as it is in every winter market. Munich offers many more options with local breweries and imported craft beers for decent prices compared to Stuttgart. 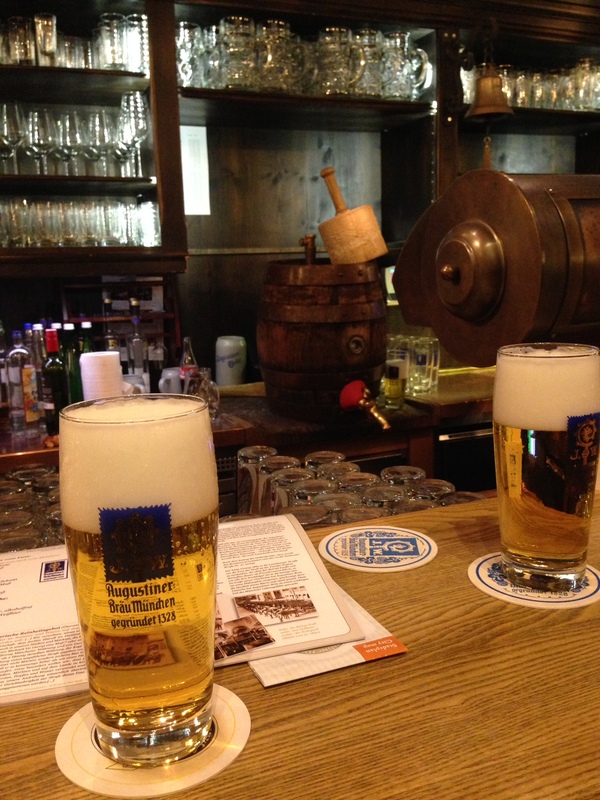 We were introduced to holz vomfass – beer served fresh on tap from the wooden barrel, generally a light pilsner or similar the bartender taps in front of you every time the barrel runs out (every hour or so). Munich Tap-House was our favorite craft beer bar by far, not to mention it’s the first we have seen in Germany at all, offering over 40 on tap with tons of bottles. It reminded us of Pour House in Tampa, Fl, only much bigger. It was the two year anniversary for the bar that night so the owners plus brewers from all over, including the U.S. were there. Pretty cool once the crowd died down and we could easily reach the bar. Camba’s IPA, also local from Munich, was a good find we will go back for. Side note: CREW Republic, another Munich brewery actually delivers to Stuttgart for free – we received one case already… I can see this becoming a trend at our house. 1. No one greeted us in English, it was a much better place to practice our German. In Stuttgart, we are only greeted in English. 2. They have local and imported craft beer. Non-existent in Stuttgart it seems. 3. We heard Italian on the regular. I thought maybe knowing a bit of another language in Stuttgart would help me but that is not the case in Stuttgart. In Munich it was everywhere. 4. Breakfast – there were French restaurants that actually served omelets (american sized). Unheard of near us.